The Canadian Regiment of Fencible Infantry, or as we are more commonly known, the Canadian Fencibles, consists of a group of people dedicated to the memory of the original regiment and to accurately portraying the regiments uniforms, equipment, and drill and life of the period. Our members come from many different backgrounds and from across Ontario with a focus in eastern Ontario. Our choice of regiments to portray was based on one that served in the area, was raised from people in eastern Ontario, and played a significant role in two key battles: the Battle of Cryslers Farm near Morrisburg, ON and the Battle of the Chateauguay, Howick, QC. We participate in a variety of different reenactments and events annually from full encampments with other recreated units at major historical sites to local events. In the past we have traveled to New Orleans, the Citadel in Halifax, Fort Erie, Crysler's Farm, Stoney Creek, Ogdensburg (in February), and other sites. An event of great significance to the members was participation in the 175th anniversary Battle of Waterloo in Belgium. We still hold many memories of this time. 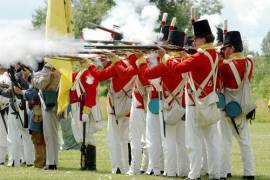 If you are interested in sharing an interest in history, portraying a soldier of a Canadian regiment, living the life of a soldier in the 1812 period with others of like interests, we would like to hear from you.